Following on from my previous post about Virgin London Marathon statistics, this is a more in-depth look at how 36,604 runners in 2010 made their way over the 26.2-mile course. The first – and for many, the most important – question many nephyte marathon runners ask is what is the average time for completing the marathon? This is a source of constant interest, and generally the answer comes back that the average time is around 4:30. 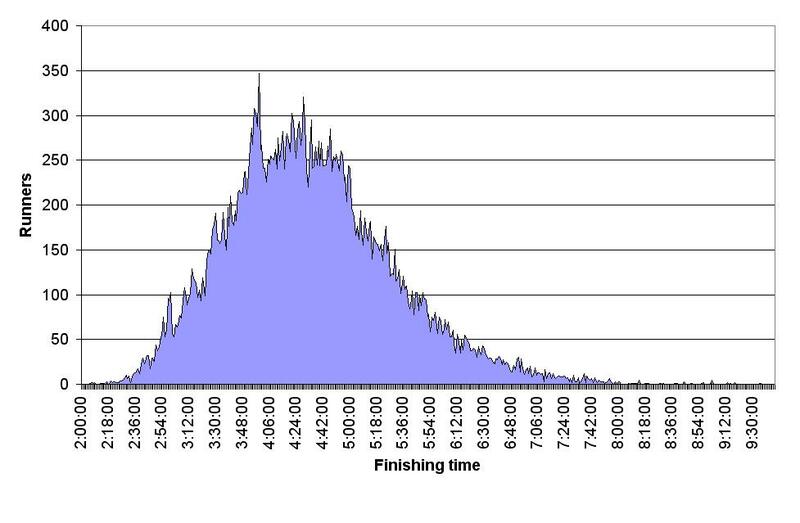 However, that depends on what you mean by ‘average’… First things first, though, here is a good old-fashioned bell curve of finishing times for the 2010 Virgin London Marathon. Now, there are two interesting things about the Virgin London Marathon results. The first is that the Virgin London Marathon lists finish times based on chip time rather than gun time. This means that the data we have here is an accurate representation of time from start line to finish line, without needing to take account of thirty minutes of hanging around at the tail-end of the field. The second interesting point is that it’s a rather spikey bell curve. The often-cited average marathon time of 4:30 is based on the point at which exactly 50 per cent of the field has passed the finish line (while the remaining 50 per cent has yet to pass the line). In mathematics, this ‘average’ is known as the median. In 2010, this point was actually at 4:28, although it’s a fairly arbitrary figure. Imagine a situation where 30,001 people run a marathon. Bizarrely, 15,000 people pass the finish line at exactly 3 hours. Perhaps even more unlikely, another 15,000 people pass the finish line at exactly 9 hours. One person completes the marathon in 4:28. In this entirely unlikely situation, the median marathon time is 4:28 – making it an almost entirely useless figure. The really interesting figure is the mode – in this instance, the minute during which the highest number of people passed the finish line. Look back at the chart and you’ll see a sharp spike that’s completely out of keeping with traditionally smooth edges of a bell curve. In 2010, the mode finishing time was 3:59 when 347 runners surged past the finish line (or 0.95% of the entire field of runners). That’s a good half hour faster than the normally quoted average. Get a little older, though, and 40-44 year olds have a mode of 3:54 (although there’s an almost equally sized peak at 4:21), a full five minutes faster than the youngest age group. In fact, the median finishing time is 4:23 – whipping past the younger category (and potentially getting them a drink at the bar before the 18-39s finally roll into the pub). The 45-49 category’s modal finishing time is 4:06, following on the tail of the whippersnappers. Meanwhile, the median for this group is also 4:23. Up we go again, and for the 50-54 bracket the modal finishing time is 4:29. This sounds like a significant drop from the previous age category, but there are actually several peaks very close (in some cases, within one finisher) to the modal time. In fact, the times are so well spread out for this category that the median finishing time is actually 4:29. Get to the 55-59 category and things start to get interesting. Once at the age category where retirement is within sight the modal finishing time comes down to 4:01. However, the median finishing time is 4:36, so it’s clear that finishers in this category are fairly spread out. The 60-64 age category sees the modal finishing time coming down to 4:42, only a little slower than the 50-54 year olds. The median finishing time is only a little behind at 4:44, putting the near-pensioners a good 45 minutes ahead of the 18-29 whippersnappers. And if you thought that was surprising, how about the fact that in 2010 three runners in this age category completed the marathon in three hours or less. Now that’s something to aspire towards. With only 274 runners aged 65-69, the results for this category are hardly statistically significant. For this age group the modal finish time falls back to 5:12 although the median is 4:55 – still faster than the 18-39 year olds. Finally, the 70+ category consists of a heroic 149 veterans. So, post-retirement, what can you expect? Well, given that there are so few runners in this category, your modal time is either 4:54, 5:07, 5:10 or 5:50 – take your pick. The median time is between 5:20 and 5:21, which means that even this category is faster than the 18-39 year olds. That’s either a depressing statement about the condition of the nation’s youngsters, or a massively inspirational group of pensioners. The holy grail of marathon running is to achieve negative splits. That is, to run the second 13.1 miles of the race faster than the first 13.1 miles. It’s well-known that this is far more difficult than it sounds, but have you ever wondered how many people manage to run the second half of a marathon faster than the first? In fact, fewer than 5 per cent of marathon runners in the 2010 Virgin London Marathon achieved negative splits. 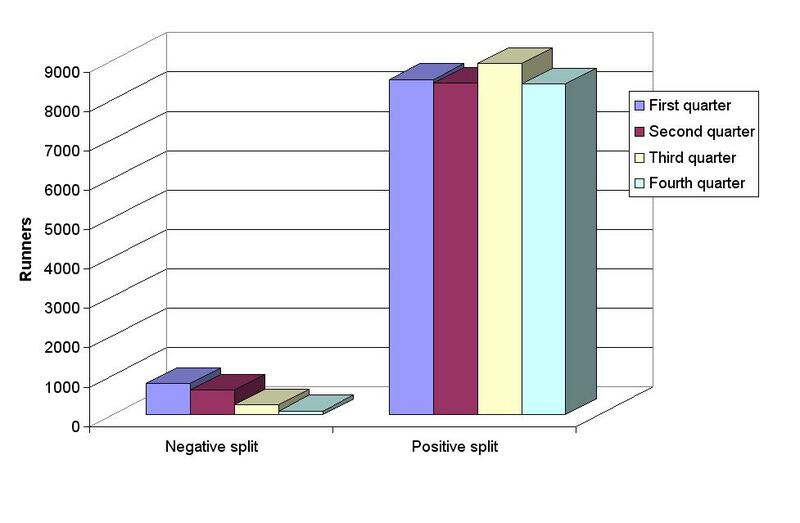 But does running a negative split really mean you’ll achieve a faster marathon time? Surely a 1:15 first half and a 1:44 second half – while technically abysmal – is still a sub-3 hour marathon? With a negative split so elusive, what hope does this offer anyone pushing themselves for a sub-3 hour marathon? Well, the average positive split is 5 minutes and 7 seconds slower than the first half of the marathon. So, when planning your race, you can either try to be amongst the 4.86% who run negative splits, or you can belt out the first half safe in the knowledge that you’ll lose a good 20-odd seconds a mile for the remaining 13.1 miles. Also interesting to see the peaks of finishers at the 4hour, 4hour30 marks – just goes to show how much of this marathon thing is psychological and about breaking recognised barriers. When I ran my second marathon at 26 years old I did it in what is still my PB – 3 hours 14 minutes. 30 years later I am still running marathons at times between 3.15 and 3.25. That’s some good running – impressive to keep such consistent times over that length of time! If you enter your times into the Runners’ World age grading calculator you’ll see that you’ve comparatively improved your performance over time. Fantastic bit of statistical information there! 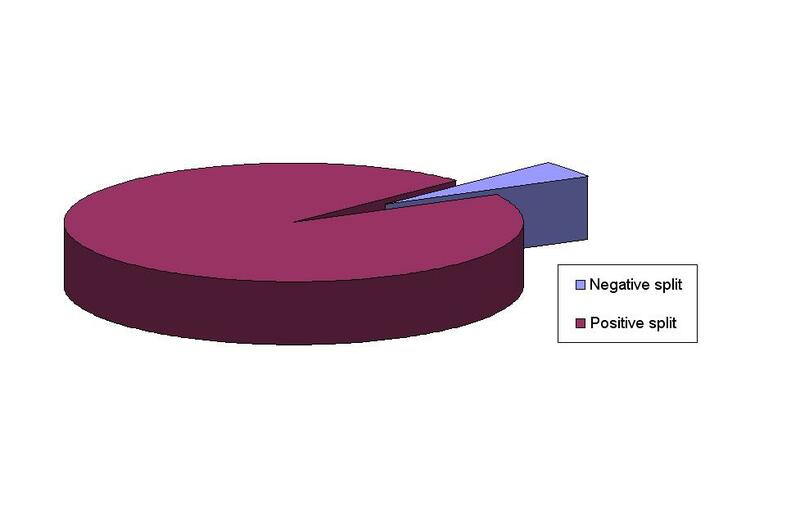 Who doesn’t love a good graph?!?! Where about did you get the raw data to do this analysis? Are the full results available for download somewhere as say as .csv file? I got these stats from the 2010 Virgin London Marathon results (http://results-2010.virginlondonmarathon.com/2010/index.php?content=search). Unfortunately VLM doesn’t provide these as a downloadable file, so it took a few hours of copying and pasting the data! I have the spreadsheet file somewhere, so will see if I can dig it out and post it here when I get a chance. Maybe a case of the good old fashion mean being the most useful stat here – involves a bit more calculation though – as the data is spikey but otherwise well shaped. You’re quite right – I’ve just gone back to the data (at http://results-2010.virginlondonmarathon.com/2010/index.php?page=11&content=list&event=MAS&lang=EN&num_results=1000&search%5Bname%5D=&search%5Bfirstname%5D=&search%5Bclub%5D=&search%5Bstart_no%5D=&search%5Bnation%5D=&search%5Bage_class%5D=18&search%5Bsex%5D=%25&search_sort=place_nosex&search_sort_order=ASC&split=time_finish_netto&top_results=3&type=search) and the median time for the 18-39 category is actually around 4:29. I’ll update the post to reflect that, and thanks again for pointing it out. 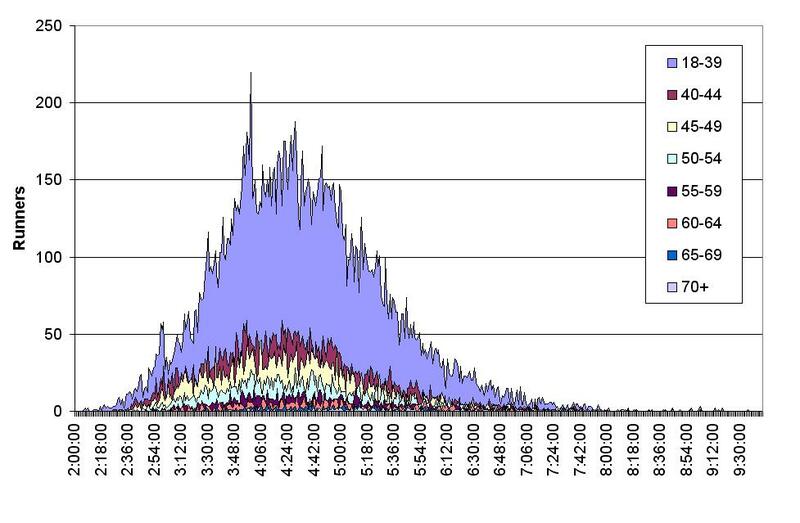 This is not a bell curve (normal distribution) – it has a longer tail to the right and no matter how many runners you plotted there would be a limit to the left (a normal distribution has no such limit). It would be interesting to know what the real distribution is. This is most likely a log-normal distribution. Log-normal distributions are similar to normal distributions, but the independent variable values are restricted to positive real numbers, and are characteristically skewed like the presented distribution.